Wallace Broecker, one of the first scientists to declare that polluting human actions caused climate change died recently. In 1975, Broecker embraced the term "global warming" in a publication for Science, where he showed that high carbon dioxide (CO2) emissions from the use of fossil fuels increase the Earth's temperature. Puerto Rico is vulnerable to global warming, associated with extreme droughts and intense hurricanes in the Caribbean region. 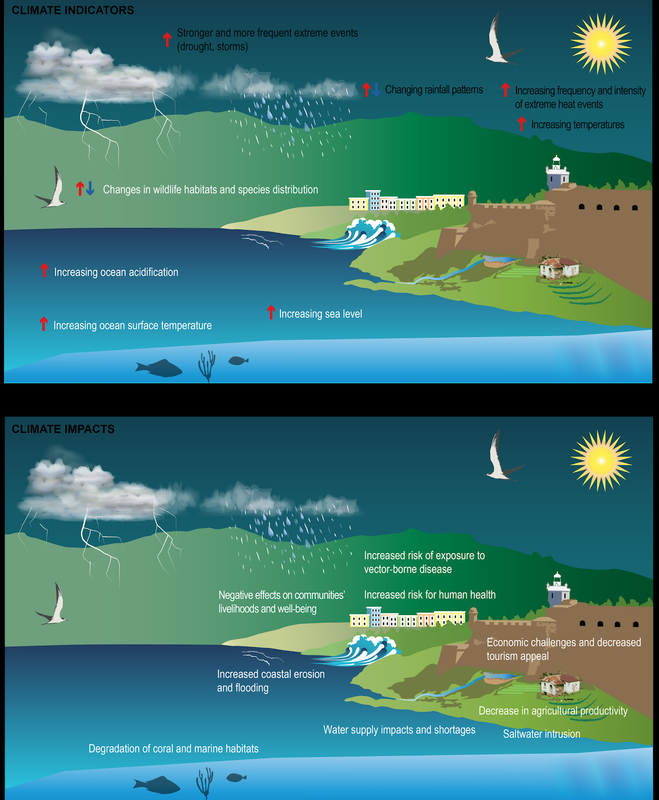 This is one of the findings described by the local and international scientists in the Caribbean chapter of the Fourth National Climate Assessment (NCA4). Almost 50 years after Broecker warned about the need to mitigate global warming, climate change is not a topic that is given sufficient priority in the political scene in Puerto Rico. This must change. Irma and Maria left $ 141 billion in losses, thousands of deaths and unthinkable consequences. Considering the high human and economic cost of these climate events, it is more effective to invest in resilient public infrastructure and to training communities for disaster risk management. Currently, we have the opportunity to use federal recovery funds in projects that result in efficient, resilient and autonomous energy, water and transportation systems. Let's start by decentralizing the electric system to reduce the dependence of millions of people on a handful of unstable energy stations that need imported fuel to function. This could be achieved by establishing solar and wind energy projects in multiple parts of the island to improve accessibility, particularly for rural communities. Let’s not forget how difficult and expensive it is to acquire fuel when the island ports and airports are inoperative. Investing in resilience is more productive than paying for the consequences of not doing so. According to the NCA4, the United States could lose 10% of its gross domestic product as a result of climate change, twice as much as during the Great Depression. Recently, progressive Democrats developed an ambitious plan to address both climate change and the financial crisis.. The Green New Deal promotes the decarbonization of the economy in ten years. In other words, it seeks to eradicate fossil fuels and greenhouse gas emissions with investments in clean technologies, such as solar panels and electric vehicles. There are states that already took the lead in developing ambitious public policies that proved to be effective. For example, California generates 29% of its energy from renewable sources as a result of energy efficiency state laws. Ten years ago, it only produced 11% of its energy in a renewable way and now aims to generate 100% of the electricity without fossil fuels by 2045. Another law promotes electric vehicles and seeks to eliminate CO2 emissions byprohibiting the sale of gasoline and diesel vehicles by 2040. Considering that California has almost 40 million inhabitants, these policies can quickly transform the life and the economy of the country. Moral: to address the great challenges of climate change, we must design ambitious strategies if we want to build resilience. Radical would be to do less and preserve the status quo that keeps us vulnerable and at the mercy of climate change. A green new deal for Puerto Rico? The country has not yet defined how or when to start addressing climate change. The government is still evaluating the Puerto Rico Senate Bill 773, which seeks to establish the island’s public policy on climate change. This bill proposes measures such as the generation of 40% of the energy from renewable sources by 2023 and the reduction of greenhouse gases. Currently, Puerto Rico generates 2% of its energy from renewable sources, but experts say that 90% of all homes could be energized with solar power. We have the necessary natural resources to achieve this, but we need leadership and political will. Meanwhile, the House of Representatives of Puerto Rico passed a resolution to create a commission for the study of climate change when there are recent and comprehensive studies, such as the NCA4, with the most up-to-date science and recommendations for adaptation and mitigation, ready to inform decision-making. Lawmakers in Puerto Rico must take climate change issues seriously and support the implementation of disaster risk reduction plans that translate into actions. Surprisingly, the government has approved and repealed 62 measures related with climate change over the past 15 years with no major impacts or benefits. Resiliency involves long term planning and establishing collaborations between the government, the private industry, community organizations and the scientific sector to devise, finance and implement climate solutions. We all have the responsibility to contribute if we want to thrive in this hot new reality. This article was published by El Nuevo Dia as part of a collaboration with CienciaPR. This is the second part of a series, the first was published on Sunday, March 10, 2019. Isabel Parés is an environmental scientist, geographer and independent researcher. She collaborates with the Caribbean Climate Center for Agriculture and Tropical Forestry of the USDA, was part of the group of authors of the Caribbean chapter of the Fourth National Climate Assessment (NCA4), is an ambassador of the Puerto Rico Science Policy Action Network (PR-SPAN) and member of Ciencia Puerto Rico.